I have a perfectly good reason for not blogging lately, or very often in the past few months in fact. I am hoping to explain that reason later this week! But last night I made the most delicious “un-chicken” noodle soup I have ever tasted. And now I am forcing myself to sit down and share it with you instead of making up silly excuses not to (present wrapping, anyone?). Winter is in full swing in Kansas, since it is of course December. And winter and the holidays make me crave one thing and one thing only – SOUP. Okay maybe I crave some holiday cookies too. But only after a big bowl of soup. If you remember I scored a used copy of Veganomicon about a month ago. I love having my own copy of this cookbook! 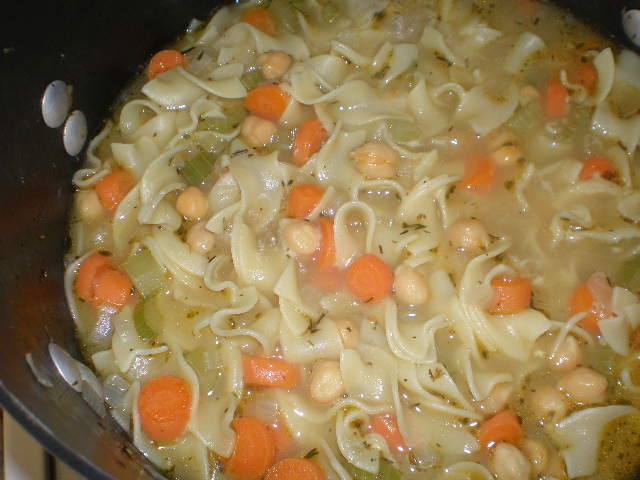 Last night I planned to make Veganomicon’s “Chickpea Noodle Soup”. It just sounded so warm and comforting and I haven’t had chicken noodle soup since I gave up chicken once and for all. I didn’t have all the ingredients needed so I changed a bit here and there and ended up with something so delicious that my meat-eating husband was exclaiming again today how tasty the leftovers were at lunch. Even better is the fact that I actually wrote down all the changes and adjustments I made so that I would remember them when writing this blog! Heat the oil in a large pot. Saute onions, carrots and celery about 10 minutes. Add garlic and herbs and continue cooking for another 5 minutes. Vegetables will be very soft. Add 6 cups of water, boullion and chickpeas. Stir to incorporate boullion. 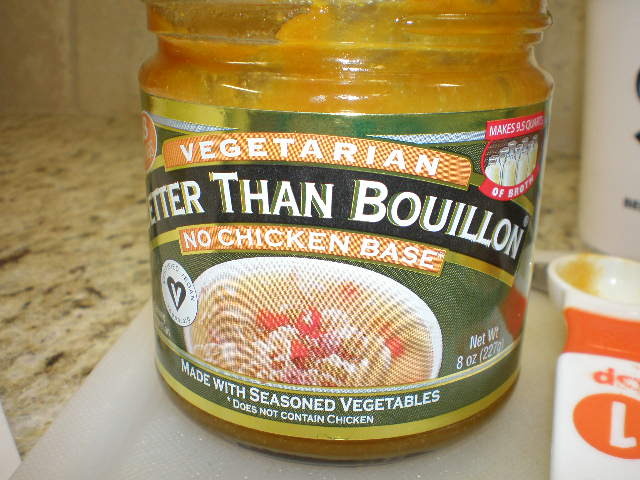 The amount of boullion needed will depend on how salty you like your soup. I started with 4 tsp and then added a 5th later on. So start with 4 and then go up from there according to your taste. Bring soup to a boil. Once boiling add egg noodles. Lower the heat, but keep the soup at a low boil. Cook for 15 minutes, stirring occasionally, until noodles are soft. Taste and adjust seasonings as desired. I think that next time I will use a full cup of chopped celery and omit the celery seed. I may also increase the amount of carrots. I just thought the soup could use more vegetables overall. If desired you could use seitan instead of chickpeas. I think I would like to try that sometime. If anyone tries that let me know how it goes. For the chickpeas I used a pint jar of cooked chickpeas I had in the freezer that I had previously cooked up using the crockpot method. This soup was SO DELICIOUS! The noodles were simply velvety. They just melted in your mouth. It may seem like a lot of work, but honestly the recipe came together quickly. I wasn’t too excited about making it at first because it was getting kind of late and I was this close to asking Benzo if he just wanted to eat out. But I’m so glad I didn’t cave to my temptations! We both loved this soup and I will definitely be making it again. This recipe was enough for both of us for dinner last night and for lunch for both of us today. They were pretty big servings. I didn’t serve the soup with anything else because I was lazy, so if we had a salad and bread with it, we would probably have gotten 6 servings instead of 4. Just some info for those of you with larger families. Oh yummy! 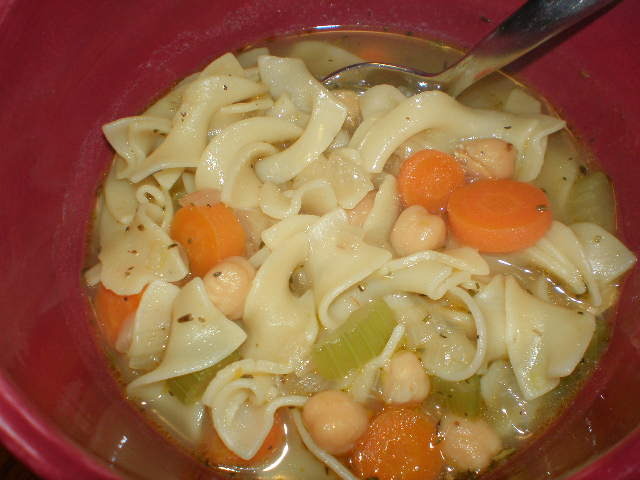 I recently made a chicken noodle soup for the hubby and it really made me want to make a vegan version for me. Now I’m inspired! Thank you for this delicious recipe. I have made it twice already and have thoroughly enjoyed it! Glad you enjoyed it Joyce!